We encourage less plastic waste. 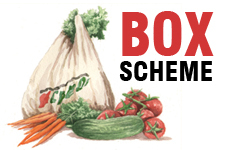 For example most of the fruit and vegetables sold at our stall and box scheme are delivered in reuseable plastic crates which are returned to the farmers, and most customers bring their own bags to take away their purchases – straight from crate to rucksack! We reuse plastic bags and plant pots too, and have discovered that the plastic boxes mushrooms are delivered in make great containers for salad growing. * closing the loop on van journeys whenever possible: we work with Forest Recycling Project and can often use vans productively for both halves of a journey, for example bringing cardboard and hessian sacks to our plant nursery for use as mulch, then taking plants and produce back to sell at the market stall.